HS Static Control Nozzles are "shockless" nozzles. The term shockless indicates that the ionizing point, located inside the nozzle tip, is capacitively coupled to the high voltage source, thus limiting the current at the point to a very low level. Under normal conditions, direct contact with the point will not result in a shock sensation. 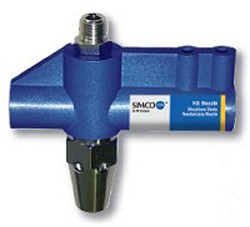 HS Static Control Nozzles can be installed individually, in series, and mounted on a standard air bar header. UL, CSA, and FM approved. Working Distance from substrate 3" to 10"